Archive for the ‘Anishinaabek’ Category. I’ve been pleased to support some very worthwhile and important work that is bringing hope for indigenous youth. Jewel’s Cause was established in response to the passing of Jewel Monture, a Mohawk youth who took her life at the tender age of 12. Known to her community as Gah wediyo, from the Turtle Clan. She was an accomplished dancer in tap, jazz, ballet, hiphop, lyrical and Smokedance. She was also a victim of abuse and bullying that ultimately left her in a state where she felt there was no way out. Many of us, and many of our family and friends have been touched by youth suicide. Despite their grief and sadness, families have found the strength to overcome their pain in an effort to raise awareness to this difficult issue. It also raises awareness of some of the associated issues suffered by the youth, including bullying, online-bullying, abuse, depression, anxiety disorders and addictions. 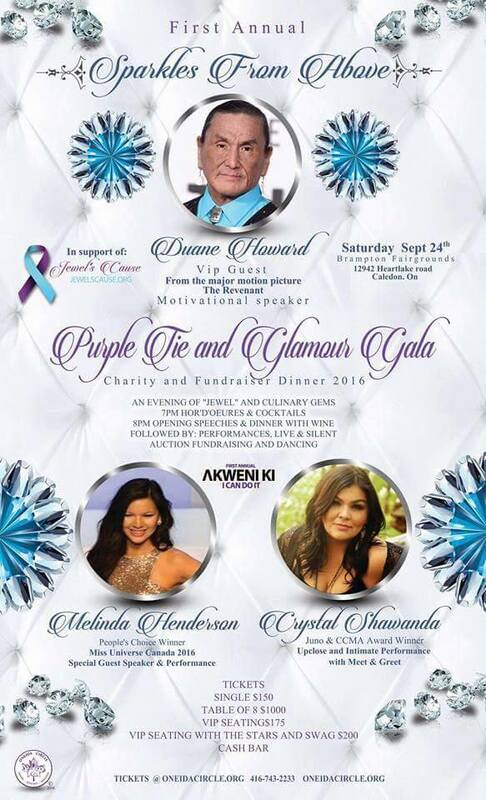 On Saturday, September 24, Jewel’s Cause is hosting the Purple Tie and Glamour Gala, in association with Brampton’s first-ever indigenous festival, Akweni Ki. 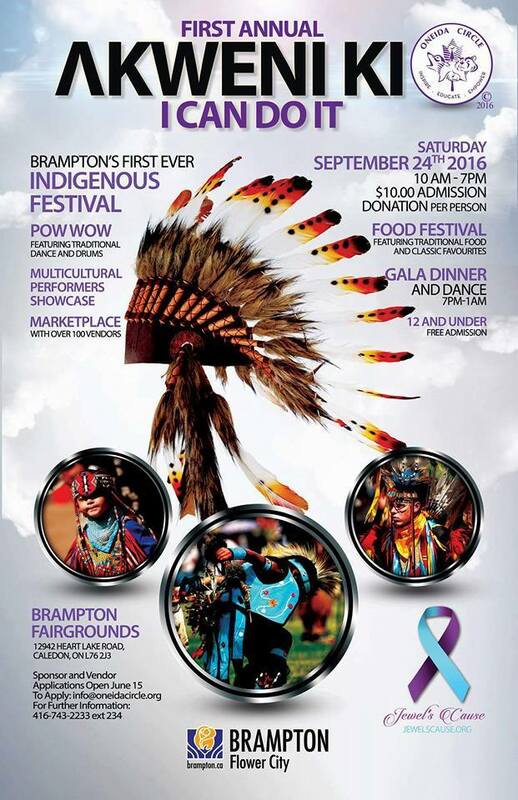 The Gala will take place at the Brampton Fairgrounds in Caledon, Ontario. Proceeds of this star-studded gala will go towards suicide prevention programs that will inspire, educate and empower youth through education, fashion, creative arts and mentoring. Please support Jewel’s Cause by buying a ticket and attending the Gala. For tickets, visit: www.oneidacircle.org. It’s time to speak up for our Lake, the Nbisiing fishery & our rights from it’s biggest threat. There are a few people around here that think they are back in the 1970s and 1980s fighting for Anishinaabeg fishing rights. They’ll post videos and messages that will trick you into thinking that they are the last free band of Indians fighting for their rights and freedom. But it’s just not the case. In reality, these misguided few are acting out of greed demanding their individual rights above all else. They speak of “inherent rights” and “treaty rights”. But what they’re really demanding is their individual rights above their fellow band members, above their grandchildren, above the Lake and above the fish. Well let me tell it like it is. 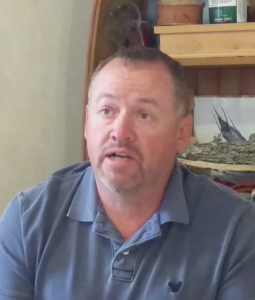 These Nbisiing fisherman… or let me rephrase that… these “Nipissing-Indian-Band-status-card-holders” are fishing illegally! 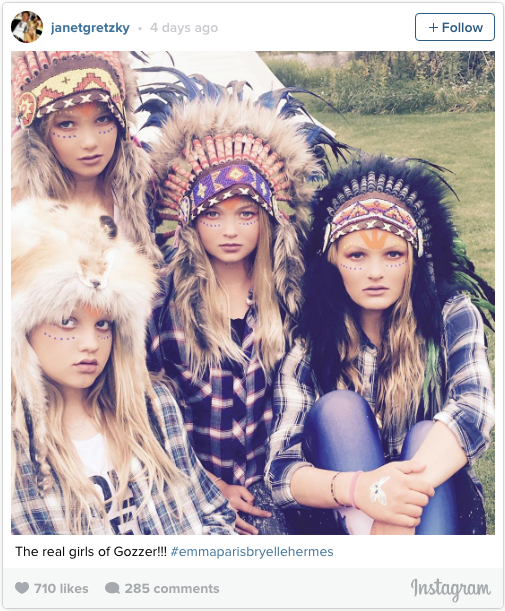 They’re certainly not acting like real Anishinaabeg. They are, in fact, the biggest threat to our Lake, our fishery and our rights. The right to harvest fish is a collective right. Period. It belongs to me, you and our compliant commercial fishers. The right to an indigenous fishery also means we have the right to regulate ourselves. Nipissing First Nation, our elected Chief and Council is doing just that with the help of the MNR. My unborn grandchildren, your grandchildren, even their grandchildren and seven generations of future Anishinaabeg also have a right to fish. They most certainly have a right to harvest walleye. The fish have a right to survive as a species on our lake. We have a right, responsibility and obligation to adhere to our most sacred of Anishinaabeg teachings: to look after all of Creation as stewards of the land and water… to speak for all those creatures who cannot speak for themselves. The Lake Nipissing walleye. Do those fishing illegally care about these rights?? Of course not. They are on the wrong side of the rights fight. 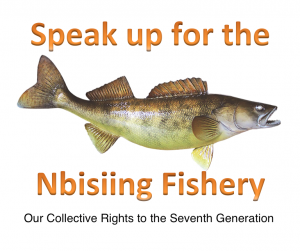 Our research… yes, Nipissing First Nation research which includes accepted scientific data, methods and analysis, clearly indicates, unequivocally, that the walleye fishery is in severe collapse. The MNR’s data shows the exact same thing. Our commercial fishery is not sustainable. That’s why our Chief and Council have closed the fishery. You argue that the numbers aren’t right. Well you got us on that one! They’re not right because you hide your real numbers in your freezers and coolers strewn about your front yards. If we had more accurate numbers from you, the data would certainly show the fishery is far worse shape. By your actions, you are saying “F*CK YOU” to the rest of us, to responsibility and to the collective rights of us Nbisiing Anishinaabeg. You wrap yourself in a phoney cape of a “rights crusader” and continue to take-take-take. That’s all you know. Take-take-take. You claim to be harassed by the MNR. Well, for the first time in history, the MNR is on our side. Nipissing First Nation signed a Memorandum of Understanding that enables them to help enforce our fisheries regulations. They’re lifting your nets because we want them to. The MNR and our fisheries department are working in partnership to stop you from fishing illegally in order to protect our fishery. This is a good thing. With all due respect, if it was my choice – you’d not only lose your nets. You’d lose your boats, trucks, and ATVs too. You don’t offer any new ideas to help the situation that you’ve helped create. How will you help protect our fishery? 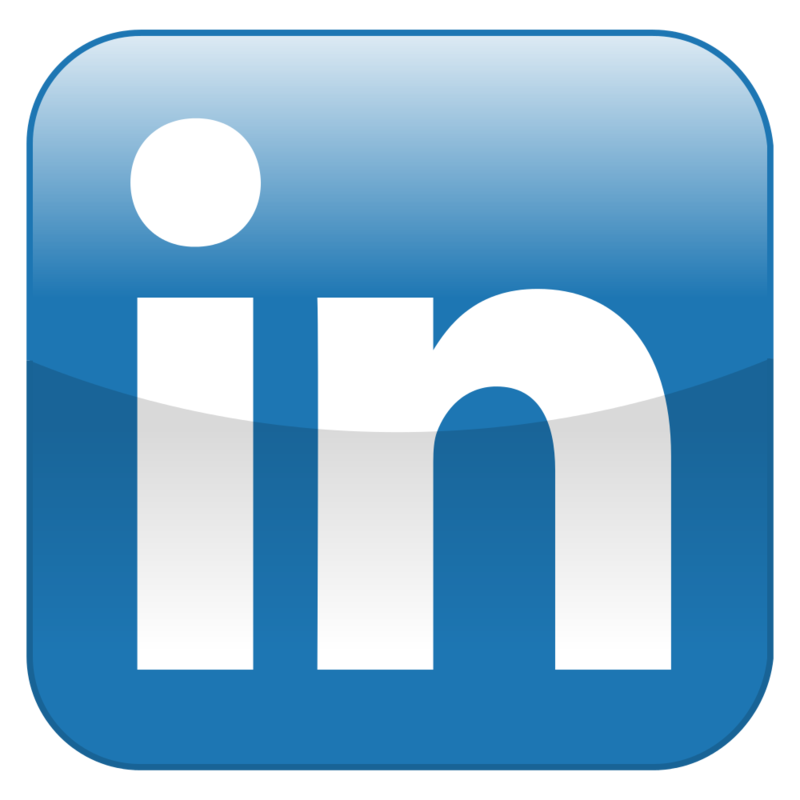 How will you ensure the sustainability of our fishery? How will you protect the walleye that had fed us for millennia? Instead you call your little meetings, talk sh*t about our Chief and Council, our fisheries program and accepted science, and wail on about standing up for indigenous rights. Well boys and girls, the right to take-take-take is NOT Anishinaabe. To disregard me and your fellow band members is NOT Anishinaabe. You teach your children to disregard the fish, the science, regulations and the rest of your fellow Nbisiing Anishinaabeg. If you continue on this course the walleye fishery in Lake Nipissing will be extinct. Our ancestor’s signed the Treaty, created this way of life and fought for these rights for the benefit of seven generations into the future. Not just for you. Not just to take-take-take. 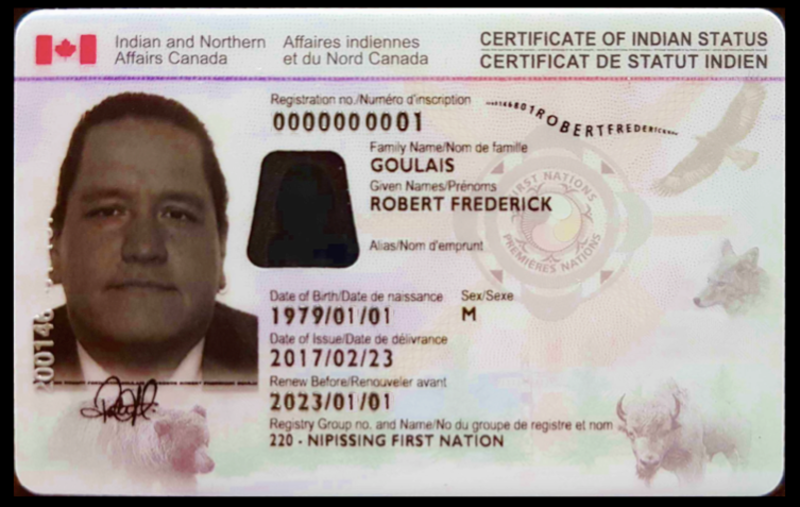 ACTION: My fellow Nbisiing Anishinaabeg, I’m asking you to speak up. It’s time to stand up and protect the lake, the fish and our right to a future fishery. I’m asking you to stand up and speak out against those who threaten our fishery. That’s not the MNR, our fisheries officials or our Chief and Council. The real threat are from those who are fishing illegally, pretending to be the righteous, who disregard what is right. My good friend and Midewiwin brother Waabishki-makwa (Brian D. McInnes) has written a new book about his great-grandfather The Late Francis Pegahmagabow. I’ve spoken with him over the years about this book, probably when it was a mere idea, long before he was writing it. For him, it was much more than a literary work but a labour of Love, respect and rightful acknowledgement of a true Anishinaabe hero and Canada’s most decorated indigenous soldier. He isn’t just a hero because of his medals or his actions in the military, Francis Pegahmagabow was truly the embodiment of what it means to be Ogitchidaa. He wasn’t just a warrior who stood up to protect his people during war-time, he was a role model and true public servant in many ways. He used his bravery and courage far beyond the battlefield for the benefit of his community and all Anishinaabeg people. 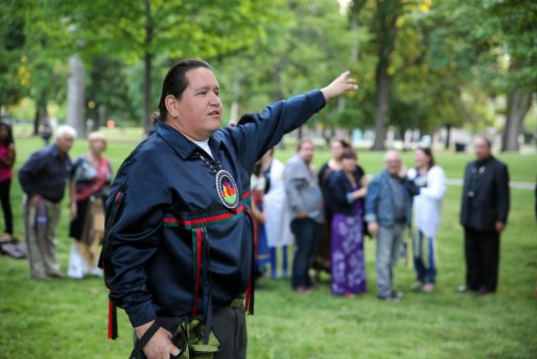 The legacy of Binaaswi-ban, Adik dodemun has been celebrated by our local Anishinaabeg communities for many years, but only recently shared by all Canadians. We remember him through the stories of his family, including my uncle Baimassige-ban (the late-Merle Pegahmagabow), many Wasauksing Elders, political and spiritual leaders, academics and writers like Brian, Waub Rice and Joseph Boyden. I’m looking forward to reading more about this man I’ve heard so much about. 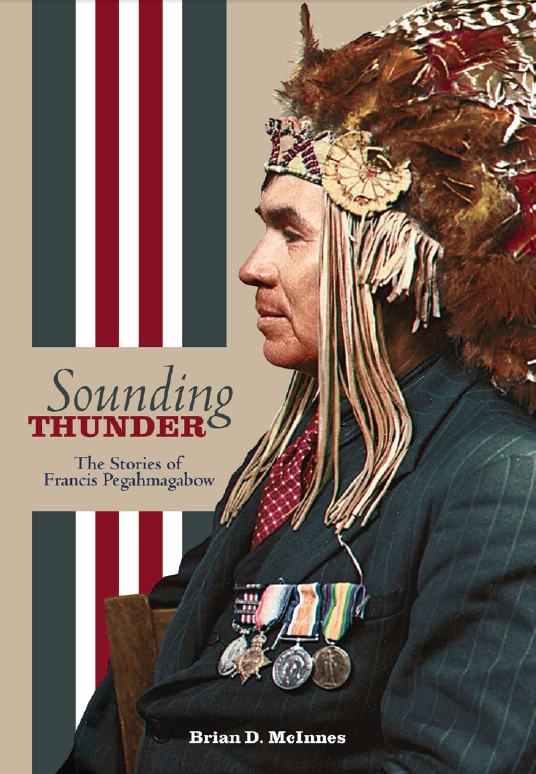 Sounding Thunder: The Stories of Francis Pegahmagabow is published by the University of Manitoba Press and will be available on September 16. Congratulations, Waabishki-makwa. You make us proud, my Brother. Chi-miigwetch for keeping his stories and memory alive. Francis Pegahmagabow (1889-1952), an Ojibwe of the Caribou clan, was born in Shawanaga First Nation, Ontario. Enlisting at the onset of the First World War, he served overseas as a scout and sniper and became Canada’s most decorated Indigenous soldier. After the war, Pegahmagabow settled in Wasauksing First Nation, Ontario, where he married and raised six children. He served his community as both Chief and Councillor and was a founding member of the Brotherhood of Canadian Indians, the first national Indigenous political organization. In 1949 and 1950, he was elected the Supreme Chief of the National Indian Government. 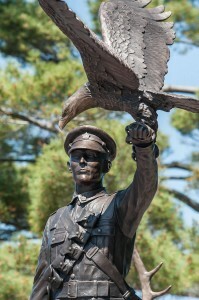 Francis Pegahmagabow’s stories describe many parts of his life and are characterized by classic Ojibwe narrative. They reveal aspects of Francis’s Anishinaabe life and worldview. Interceding chapters by Brian McInnes provide valuable cultural, spiritual, linguistic, and historic insights that give a greater context and application for Francis’s words and world. Presented in their original Ojibwe as well as in English translation, the stories also reveal a rich and evocative relationship to the lands and waters of Georgian Bay. In Sounding Thunder, Brian McInnes provides new perspective on Pegahmagabow and his experience through a unique synthesis of Ojibwe oral history, historical record, and Pegahmagabow family stories. Brian D. McInnes is a professional educator and author dedicated to diversity education, youth engagement, and organizational leadership. 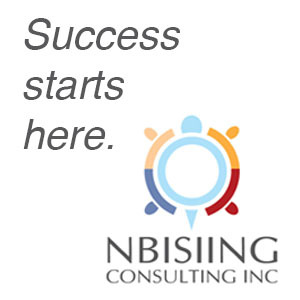 A member of the Wasauksing First Nation, McInnes has a deep interest in the preservation of Indigenous cultures and languages and is an accomplished speaker, presenter, and writer in English and Ojibwe. 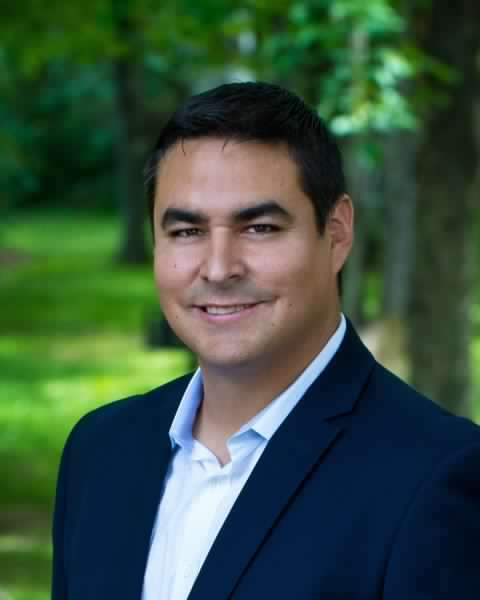 Brian is a descendant of Francis Pegahmagabow, and writing Sounding Thunder was an important opportunity for him to contribute to the legacy of his great-grandfather. We are not the children of the 8th Fire… Far from it. I don’t like to write anything pessimistic. When you start off your column with “I don’t like” you know it’s going to be one of those days. 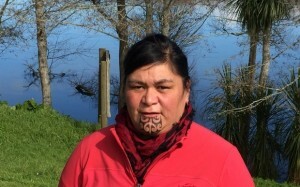 Nanaia Mahuta. Photo by Radio New Zealand. 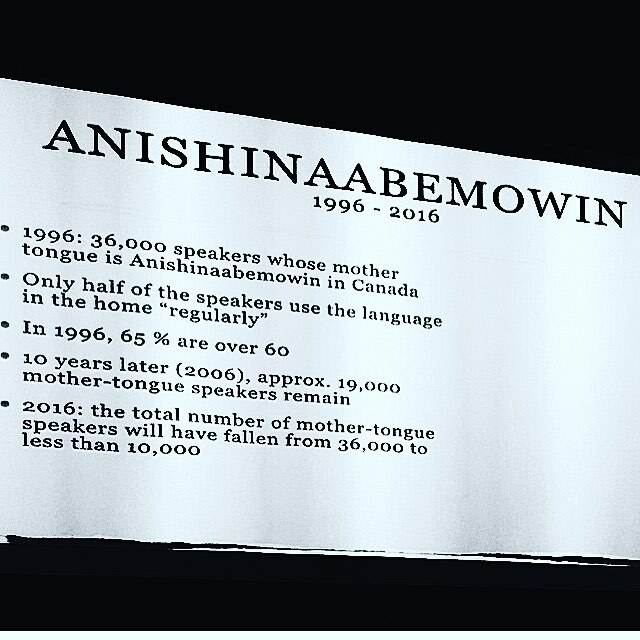 It’s so good to see that Indigenous people from around the world, including many Anishinaabe, who are taking steps to make our language and culture a priority. A good day, so far. I scroll further down my Facebook feed only to get a punch in the gut. I put my omelette down. These are stark and troubling statistics. It makes me so sad, almost hopeless. I scroll down a little further and up pops an ignorant photo posted by Janet Gretzky, the wife of my hockey hero. Fuming, I started to share and write a call to action. But it occurred to me that this isn’t supposed to happen this way. We were to be the children of the 8th Fire. The Anishinaabe, through our 8th Fire Prophecy, were predicted to thrive. We were to become equals, to come together with our other brothers and sisters in our territory and contribute towards becoming one great nation. Our language and culture would be sought after. The colonizers would realize the folly of assimilation, value our ways of life, and seek out our advice and traditional knowledge for the betterment of society and Mother Earth. We are not the children of 8th fire. We are far from it. That’s as pessimistic as it gets. It’s time to turn it around. We have to realize that a prophecy isn’t just going to magically happen on it’s own. It isn’t karma, destiny, fate or the will of God. The Midewiwin certainly can’t influence midichlorians, as the Jedi do, to impose our goodwill over the Earth. There will be missteps and setbacks along the way. We must learn from our Anishinaabe prophecies. We must act to avoid those missteps within the prophecies. For example: The prophecies tell us that “the rivers will run with poison and the fish will become unfit to eat”. That’s precisely why Anishinaabeg women are standing up for the water. We must learn and adapt in order to take ourselves, our families, our nation in the right direction to ensure we lead the Anishinaabeg into that eighth and final fire of glory. We must continue to take action. This action must be personal action. Only I (only you), can work towards learning Anishinaabemowin. 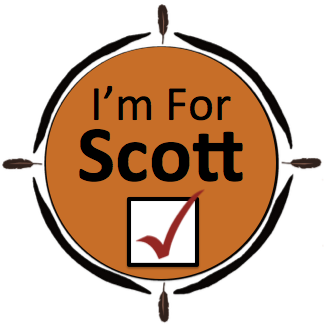 Only I (only you), can take political action that makes our language a governmental priority for our First Nations governments, political leaders and our federal and provincial government by demanding programs, funding and support to our priorities. Only I (only you), can stand up to those who act inappropriately by furthering negative stereotypes and trivializing our culture and it’s sacredness. Only I (only you), can say something when you see an act of racism or someone who is treated disrespectfully. Only I (only you), can contribute personally towards the goals of reconciliation between Indigenous and non-Indigenous people. The 8th Fire is coming. We all need to be ready for it whether it’s this generation or the next. We have to learn today what it takes to be better tomorrow. Never give up. Never succumb to statistics and social media pessimism (even if it is mine). More and more urban communities across Turtle Island are hosting traditional gatherings. In the Greater Toronto Area, we’ve seen one-day gatherings spring up in Orangeville, Aurora and Pickering on top of the successful pow-wows put on by the Native Canadian Centre, Native Men’s Residence and Native Child & Family Services. The Oneida Circle is hosting the first annual Akweni Ki Indigenous Festival, on Saturday, September 24. The festival includes their first ever traditional pow-wow and an evening gala featuring Anishinaabe recording artist Crystal Shawanda and Oji-Cree Miss Universe contestant Melinda Henderson. This gathering is gaining a lot of momentum and excitement. It is turning out to be the fall pow-wow that you just can’t miss. I personally would like to invite all my pow-wow family… all singers, dancers, hummers and limpers to add this to your calendar and plan on attending. Grand Entry: Saturday, September 24 at 12 noon. The North Bay Comedy Festival, August 12-15. Be there or be… somewhere else. I want to give a big shout out to support my friends Clint Couchie and Ryan McMahon. These guys are putting the mainstream into Aboriginal comedy. No longer does Nish humour have to be niche humour. Today, these young indigenous comics are entertaining diverse audiences from Winnipeg to Montreal… and all locales in between, including North Bay. 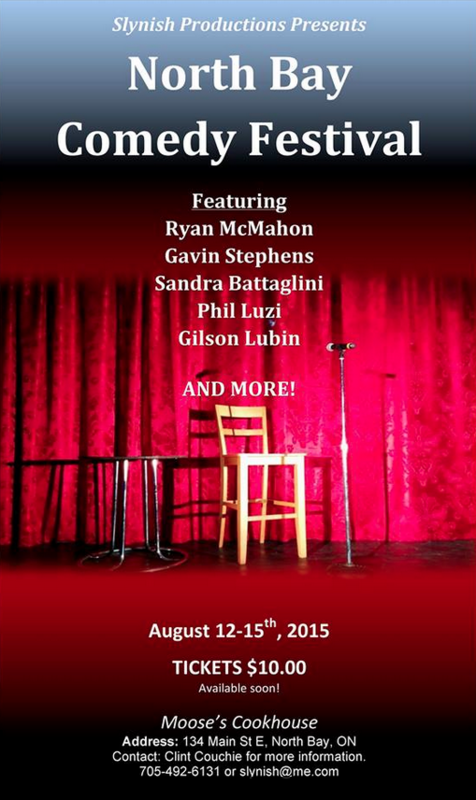 Slynish Productions is organizing North Bay’s first Comedy Festival taking place August 12-15, 2015. The headliner will be Winnipeg’s very own Ryan McMahon who will be at Moose’s Cook House in North Bay on the evening of August 12. 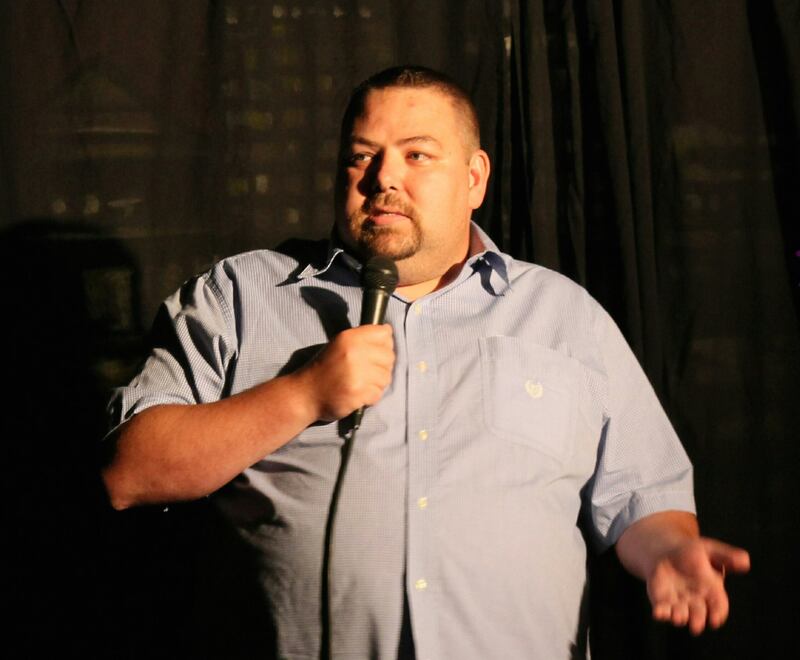 Clint Couchie will also be performing as well as fellow comics Gavan Stephens, Phil Luzi, Sandra Battaglini and Gilson Lubin. All local comedy fans, please support the North Bay Comedy Festival. If you are planning to visit the North Bay area, check out some good gut-bustin’ comedy. The wings are pretty good too! Be there or be… somewhere else. Ayyyy! Just kidding!! Dew!!! Baw!!!! 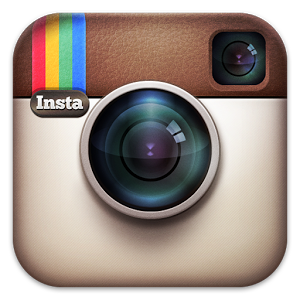 Category: Anishinaabek, Personal | Comments Off on The North Bay Comedy Festival, August 12-15. Be there or be… somewhere else.